Web development is evolving blazingly fast. Over the past 15 years, dozens of frameworks and libraries have come and gone, being replaced by even more effective tools. So, to keep you updated, we’ve analyzed the most trending web development tools in 2019. Learn which technology fits your web app project best and stay in the mainstream for the upcoming years. With React development, you can break down a complex UI/UX development process into small components, thus simplifying the workflow. And since these components are reusable, you can apply them across different projects without rewriting the code. 156 303 live websites use React library, including Yahoo, Facebook and BBC. And we will see this number grow in 2019. In fact, you can see the rising popularity of front-end web development with React compared to other tools on the graphics below. React applications run faster and have component-based user interfaces. No wonder that more companies hire React developers for their specific needs. But what about the competitors of React? Google is constantly improving this framework (from Angular.js to Angular 7.0 version). Angular web development is mostly used for creating single-page, small or middle-size web applications. And this is why. Unlike with React, Angular development includes two-way data binding, which might cause performance issues of complex web apps and longer load time. So, for more complex web projects we recommend considering other frameworks, like React. However, since Angular is a complete solution, you can save time on choosing the right frameworks & tools and just focus on your project. Fast development, easy integration with other technologies, and rich toolset are the main reasons why many companies choose Angular to develop their web apps. The popularity of Angular speaks for itself: Forbes, Google and Whatsapp have chosen Angular for their projects. 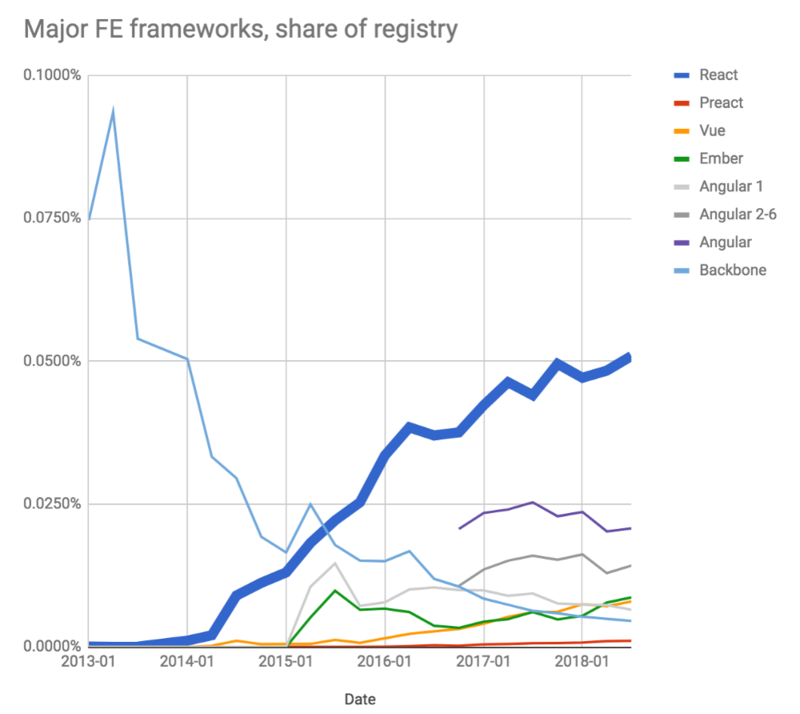 In 2019, Angular developers will stay in high demand due to the power of this framework. And since it’s not as easy to learn, as Vue, for example, Angular programmers are so valuable. The initial idea of Evan You, Vue.js founder, was to build a tool easier to learn than Angular. As a result, he created a high performance and productive Vue.js library, letting you create a website or an app faster than with other tools. Vue CLI makes it easy to start and scaffold a new project since any feature can be added as a plugin. So you don’t have to plan every little detail ahead. You might want to use Vue development services for building outstanding user interfaces for simple to more complex web platforms. Either way, Vue.js development will continue to grow in the nearest future. All in all, Angular has established itself as a stable and rich of tools framework while React and Vue are a little bit simpler for developers. Interesting fact: switching from Java to Node.js development allowed PayPal to decrease its response time by 35%. Besides, there is a number of tools that simplify web development for Node.js. Express.js, Mean.js and Sails.js frameworks are the most popular of them. Go, also known as Golang, was initially created by Google to bridge the gap between Python and C languages as well as to speed up the development process. It’s simple, fast, has a clean syntax and doesn’t require much memory. Right now, Go web development is literally skyrocketing in popularity. Go is the fastest growing language on GitHub in 2018 with 7% yearly growth. Such giants as Netflix, Uber, BBC and Dropbox has taken advantage from Go development. Google uses Golang for their internal business projects and Canonical – for their backend infrastructure. It’s scalable and extremely flexible to changes. And unlike most other web development languages, Go uses concurrency in a resource-saving way. This allows to build higher performance apps while also saving memory and CPU resources. So it’s often applied for networks of multiple computers or websites who handle many users at the same time. Most often, Golang development lets you accomplish the same tasks much faster than Python. Its performance is often compared to Java or C++. And since goroutines are so light, hundreds or thousands of them can run at the same time. Python is a giant in web development with a well-established reputation. All thanks to a robust library of Python modules, letting you add functionality without writing more code. And its code can run across various platforms without any alterations. Python web development has risen in popularity even more during the last couple of years. Youtube, SurveyMonkey, Instagram are developed in Python. On the graphics below, we can see its dynamic growth in the last five years. 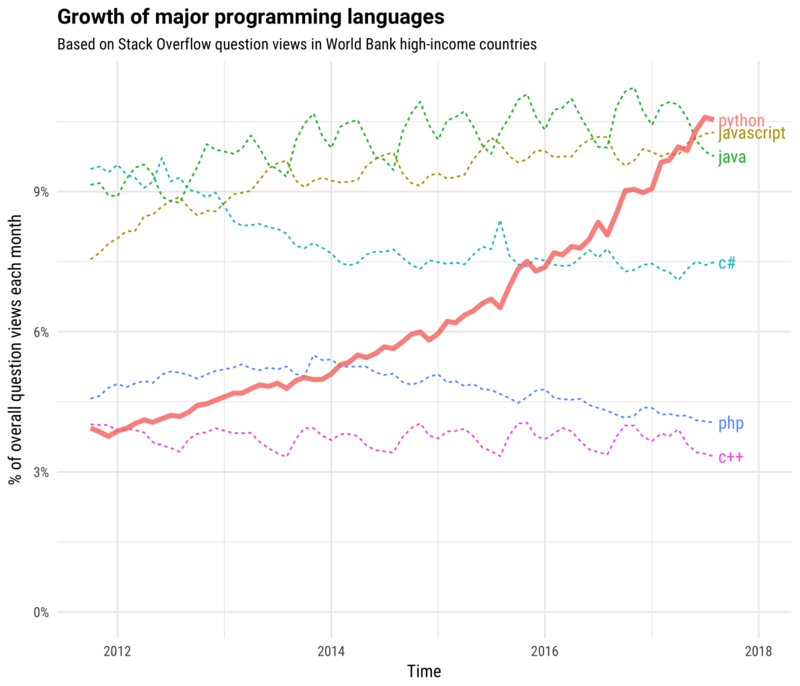 And Python developers will only grow in demand in 2019 as it is one of the easiest languages to learn. No, it’s not dying. Keep dreaming. Moreover, C# got its second breath in past years with a growth of enterprise application development. It is an elegant object-oriented language by Microsoft, with .Net being its main framework. With C#, you can build strong and secure web apps and do it faster than with C++. Unlike most of other languages, C# is quite universal – which means it can be applied for a variety of desktop, web or mobile projects. Or you can even switch between them with little additional resources. Among the other strong sides of .Net we should mention garbage collection, type-safe nature, and easy to use frameworks for building MVC web apps. .Net developers are highly in demand now, with C# language listed 7th most popular programming language in 2018. In 2019, companies will look for the best .Net developers to build reliable business-focused applications, IoT systems, databases and web portals, benefitting from Microsoft strong support. This design language by Google is aimed at combining principles of quality design with the innovation of technology. Software development companies use it to build web apps with interactive & consistent user experience across all platforms (web, Android and iOS). With latest updates and improvements of Material Design presented on Google I/O in 2018, the tendency to follow these guidelines is unlikely to disappear anytime soon. 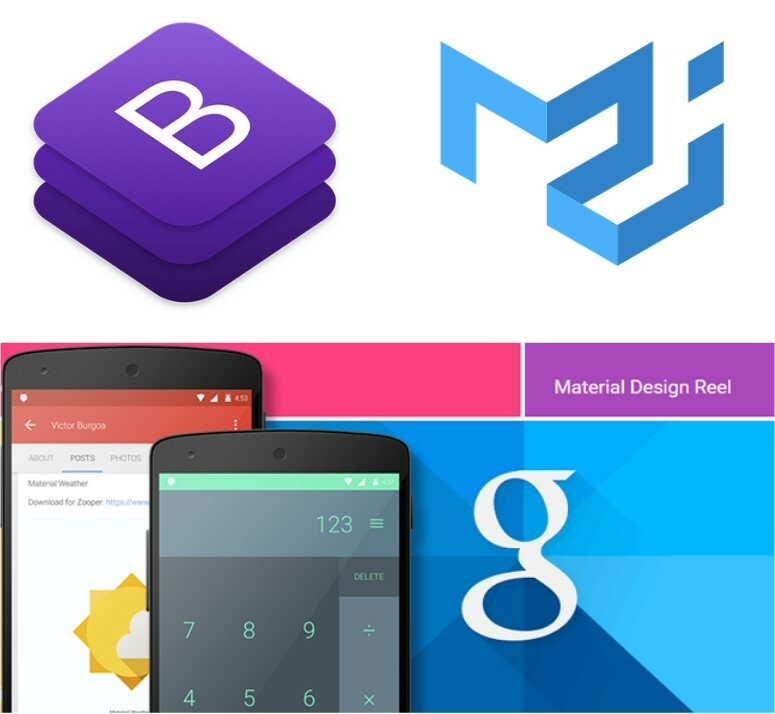 Material UI is a CSS framework and a set of React components bringing Material Design to reality. It lets you build web apps with depth effects, animations, motion, grid layouts and much more. Moreover, you can customize web design to your brand with intuitive styling options. With this JS, CSS and HTML framework, you can develop your web app fast and easy. Bootstrap supports the majority of browsers, adds consistency to web app design and makes it responsive across devices. It involves HTML and CSS design templates for various forms, buttons, tables and other webpage elements. It’s second the most rated project on GitHub, and it will continue to grow in 2019. Right now, most of web services and web portals on the Internet are database-driven. As the name says for itself, a database lets you store & manage large amounts of data. There are two main types of databases – relational (SQL) and non-relational (noSQL). So, it’s vital to choose the right database for your web-based solution. PostgreSQL is considered as the most advanced, open-source solution, which can handle multiple tasks efficiently. It also has a lot of useful third-party tools to better manage and use the system. It’s a particularly scalable & flexible solution, running on Windows, OSX, Linux and some other OS. You can use PostgreSQL for medium or large & complex applications like Microsoft and IBM already did. This database is listed among the most trending databases for 2019 according to predictions. MongoDB is a document database used for high speed and large applications. Being a cross-platform solution, it stores data as flexible documents which are easy to work with. Now that you’re aware of the most trending and useful tools for web development this year, you can go ahead and start discussing your project with the IT software development company on equal terms. Just remember to choose the right technology stack and set clear goals. With a trusted software development partner, you can build your web app efficiently and adapt to constantly changing tech trends. Lviv as your IT outsourcing destination – is it really the best choice?